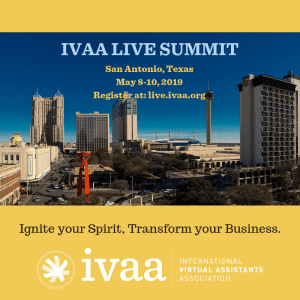 What are the IVAA Summits? IVAA members have the opportunity to participate in educational summits at a discounted rate. Our summits offer educational presentations on subjects specific to the virtual assistant industry, covering many different aspects of the industry. Our live Summit takes place every 2nd year. Members have the opportunity to meet each other in person, network, and participate in an exciting program of presentations and events. This is a ‘must attend’ event for many members! The next Live Summit will take place in May of 2019 in San Antonio, Texas! For more information (and to register when available), go to live.ivaa.org. Our Online Summit gives VAs the chance to attend a wide range of professional and educational sessions without leaving your office. These sessions are available live (but virtually via webinars!) and via recording with your paid registration fee. For more information (and to register when available), go to online.ivaa.org.